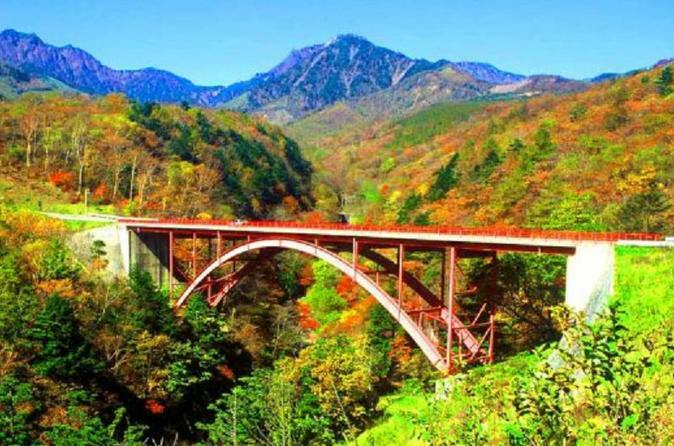 Enjoy Yamanashi Prefecture in autumn colors on this day trip featuring a scenic train journey and views from a spectacular bridge. In addition, pick seasonal grapes, visit a cheesecake factory and look forward to a buffet lunch high up in the sky! The first half of the trip takes in the wonderful autumnal scenery Yamanashi has to offer starting off on the Yatsugatake Kogen train before snapping plenty of photos at Higashizawa Ohashi Bridge. Break for lunch at Sun Meadows Kiyosato and in the afternoon, enjoy shopping at Yatsugatake Cheese Cake Factory and grape picking in Katsunuma to end the tour on a sweet note. The tour will return to Tokyo around 18:25. This is a seasonal tour limited to mid-October and early November departures. The tour sets off from Tokyo at 8:20 heading to Yamanashi Prefecture for a day of admiring autumn leaves and lots of eating! The bus will drop you off at Kiyosato Station, the highest station in Yamanashi and entrance to the popular highland area. Board the Koumi Line (also known as the Yatsugatake Kogen line) and enjoy the scenery during the 5.9km journey to Nobeyama Station, 1,345m above sea level crossing into Nagano Prefecture. Pop back on the bus again at Nobeyama with the tour moving onto Higashizawa Ohashi Bridge, a vermillion bridge not too dissimilar in color to San Francisco's Golden Gate Bridge, that spans a gorge with wonderful views of the Yamagata mountains and forests bursting in reds, golds and yellows. Spend 20 minutes getting some great social media worthy photos to make your friends and family envious! After a morning of autumn leaves sightseeing, it's time to return to Kiyosato by bus for lunch at Sun Meadows. Enjoy a buffet featuring around 40 different dishes using only the freshest of ingredients which prides itself on the local vegetables. You have 50 minutes for lunch and to enjoy the fresh highland air. Make sure to keep some room in your stomachs as the afternoon activities continue on the theme of food! First up is a visit to the Yatsugatake Cheese Cake Factory for a spot of shopping for half an hour. The shop uses local dairy products for their specialized cheesecakes so make sure you buy some as a souvenir and to try immediately! The tour then heads to Katsunuma (part of Koshu), the final stop on the tour, for grape picking. Katsunuma, and the Koshu area more generally, is known as Japan's wine country and the center for the study of grape cultivation, so there is no place better to pick the fruit! You have half an hour to pick and eat as much grapes as you can and the farm's homemade raisin bread is also included. Board the bus for the final time returning to Tokyo around 18:25.